On this DVD Roman provides a very instructive handbook for players of all levels that will keep you correctly focused on middlegame ideas and concepts.These ideas are based on opening strategy as well as basic principles ,also Roman will give you powerful presentation on pawn structures. Roman will demonstrate using examples taken from his own games and favorite openings, the important of understanding the opening ideas and what to strive for transitioning into the middle game. The basic principles of chess such piece development and placement as well as pawn structures will help determine each player’s criteria to create a course of action. For example if your opponent has an isolated pawn one idea given is to exchange pieces to weaken your opponent’s position. Also how to take advantage of symmetrical pawns structures which usually favor White.Examples on blockading pawns and dominating squares are given to enlighten the viewer so these concepts can be recognized and applied to their own games Pawn structures are difficult to access at any level so to come up with the correct plan requires a deep understanding of the opening strategies and concepts which this DVD will help provide to you. So sit back and let Roman once again increase your level of understanding of the middle game. 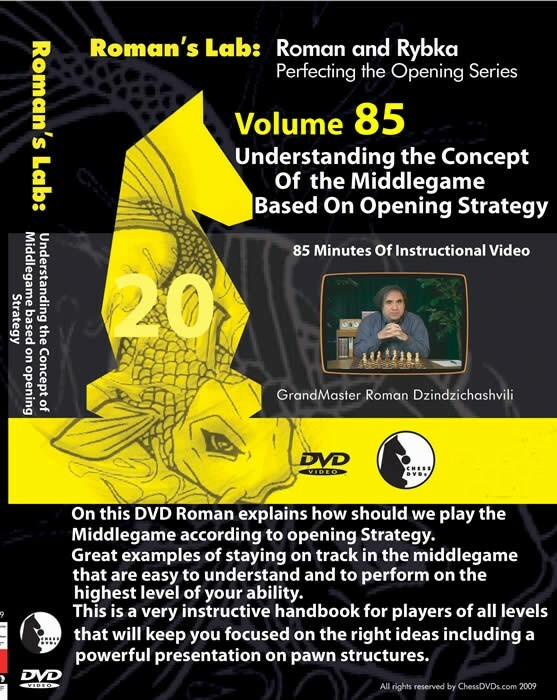 Volume 85 Understanding The ConCept Of the Middlegame Based on Opening Strategy 81 minutes On this DVD Roman provides a very instructive handbook for players of all levels that will keep you correctly focused on middlegame ideas and concepts.These ideas are based on opening strategy as well as basic principles ,also Roman will give you powerful presentation on pawn structures. Roman will demonstrate using examples taken from his own games and favorite openings, the important of understanding the opening ideas and what to strive for transitioning into the middle game. The basic principles of chess such piece development and placement as well as pawn structures will help determine each player’s criteria to create a course of action. For example if your opponent has an isolated pawn one idea given is to exchange pieces to weaken your opponent’s position. Also how to take advantage of symmetrical pawns structures which usually favor White.Examples on blockading pawns and dominating squares are given to enlighten the viewer so these concepts can be recognized and applied to their own games Pawn structures are difficult to access at any level so to come up with the correct plan requires a deep understanding of the opening strategies and concepts which this DVD will help provide to you. So sit back and let Roman once again increase your level of understanding of the middle game.